Based on the PMBOK® Guide – Fifth Edition and the ISO standards. Managing quality on projects is the responsibility of the project manager whether it is the quality of the product or service provided by the project, the quality of the project management of the project or the quality of products or services procured from providers outside the project. This course addresses how to plan for quality on your project, how to ensure that you will be able to deliver the quality agreed and how to determine if you have actually delivered the quality as agreed. 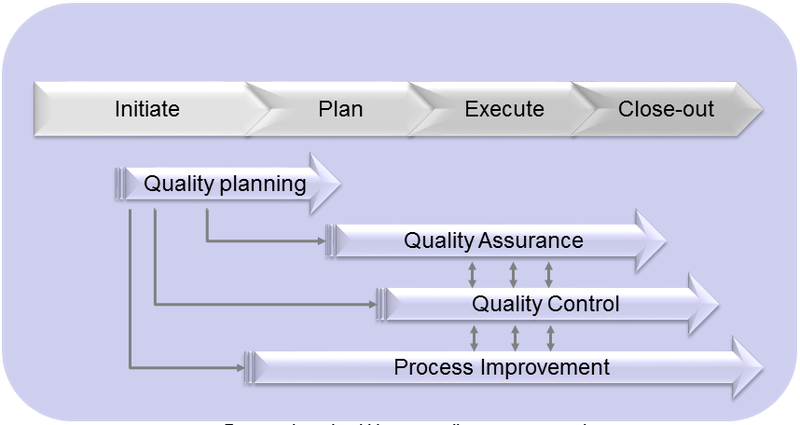 It also addresses the role of quality improvement on projects. These aspects incorporating lectures, discussions, and practical classroom exercises are addressed in this course. What level of quality do we need? 02-How do we plan for quality? 03-How do we make sure we can deliver quality (Quality Assurance)? 05-How do we improve the quality? Delegates must understand the basic principles of project management and must have experience in managing projects. Course duration:- two days (14 hours) classroom format instructor-led training in a relaxed learning environment allowing for real-time feedback, questions and answers, and practical exercises. Please contact training@pmta.co.za for more information or a quotation.